. How to use the new looper technology to enhance your performance and practicing. • Walking bass lines and improvising a melody simultaneously. - Using loopers and other technologies to enhance live performance. • Career promotion / understanding "the music business"
- Help for those with perfect pitch in navigating the world. 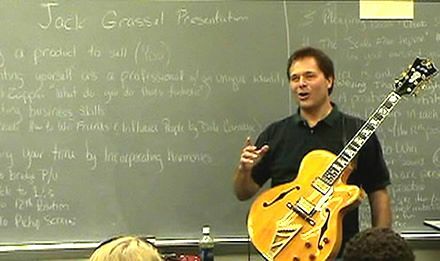 Jack in 2005 teaching a music business class as the guest artist at Western Illinois University. He travels anywhere to teach (and play) music. A student combo at Milwaukee Area Technical College in 1984. Left to Right: Joe Kroll, John Dereszinski, Steve Comeau, Don Madden, Jack, Mike Robeson, Mark Moorer. ​- Click on each orange name to meet some wonderful people who are now virtuoso musicians, recording artists, luthiers, composers, authors, inventors, music merchants and teachers at employed in the music business.